The 64 m long fishing vessel 'Amaltal Columbia' was abandoned after a blaze started in the after part & spread throughout the vessel. All 43 crew of the 64m New Zealand fishing boat Amaltal Columbia, owned by Talley’s, have abandoned ship and been transferred to two other fishing vessels following a fire on board, approximately 70km north-east of Lyttelton Heads. A total of 39 members of the crew are now safely on board the Russian fishing vessel, the Ivan Golubets, which initially responded to the mayday call from the vessel. Four other crew have been transferred the San Discovery, which subsequently arrived at the scene. The crew are being taken to Lyttelton, and no injuries have been reported. 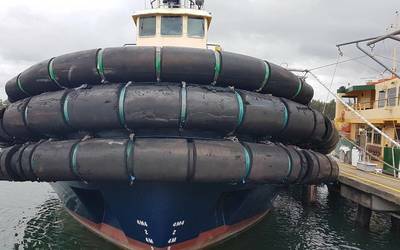 Martime New Zealand Search and Rescue Mission Coordinator Tracy Brickles said the safe transfer of crew off the vessel was an excellent result. RCCNZ will continue to monitor the Amaltal Columbia, which remains the responsibility of the owner.